NEW BRITAIN - It’s nice to be appreciated, a tableful of New Britain police officers agreed Thursday as they finished plates of hamburgers, hot dogs, salads and chips. “It’s good to know there are people still behind us,” said Matt Smith, polishing off a cheeseburger. 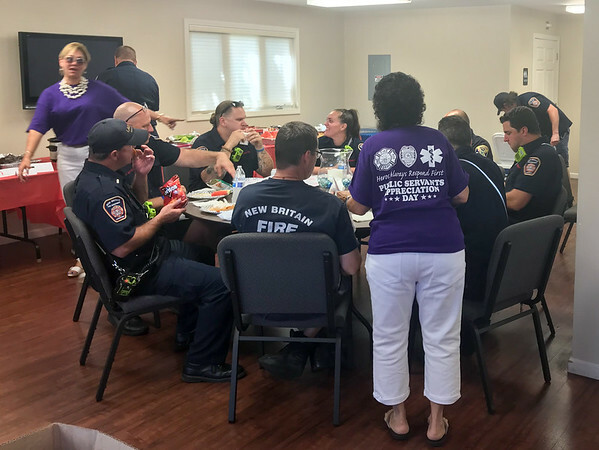 Dozens of the city’s police, firefighters and emergency medical responders were treated to a barbecue during their workday, hosted by the New Britain Memorial–Donald D. Sagarino Funeral Home. This was the funeral home’s third annual Public Service Appreciation Day, meant to let emergency responders know that their services are vital. The funeral home and the responders often deal with each other during families’ worst moments. The barbecue is an opportunity to not only give back but socialize in a happy setting, Targonski said. Food was available from 11 a.m. with police, firefighters and EMS personnel able to come in between calls, sit down and have a nice meal including hamburgers, “Georgia Red Hots,” hot dogs, kielbasa, salads, watermelon and cookies. Each public servant who attended was given a “survival kit,” which included Life Savers, Hershey’s Kisses, gum and Starburst candies. Between 150 and 200 people attended last year’s barbecue. Targonski and her co-worker, Barbara Thompson, expected about the same number Wednesday. Thompson was the cook, working over the grill placed on the deck of the funeral home’s New Britain Event Center as a ladder truck rolled up to Farmington Avenue, then parked, and firefighters came streaming out. Posted in New Britain Herald, New Britain on Thursday, 30 August 2018 20:33. Updated: Thursday, 30 August 2018 20:36.